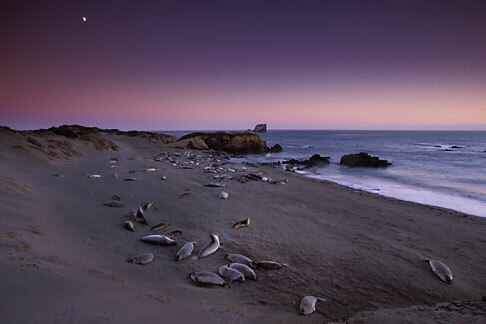 This stock photo of California, San Luis Obispo County, San Simeon, elephant seals with moonrise, Alamy Images number AK63DF, is available for licensing through Alamy Images for commercial and editorial uses including websites, books, magazines, brochures and advertising. Restrictions may apply for images which contain third party copyrighted material or sensitive subjects. Photos of artwork are for editorial use only.